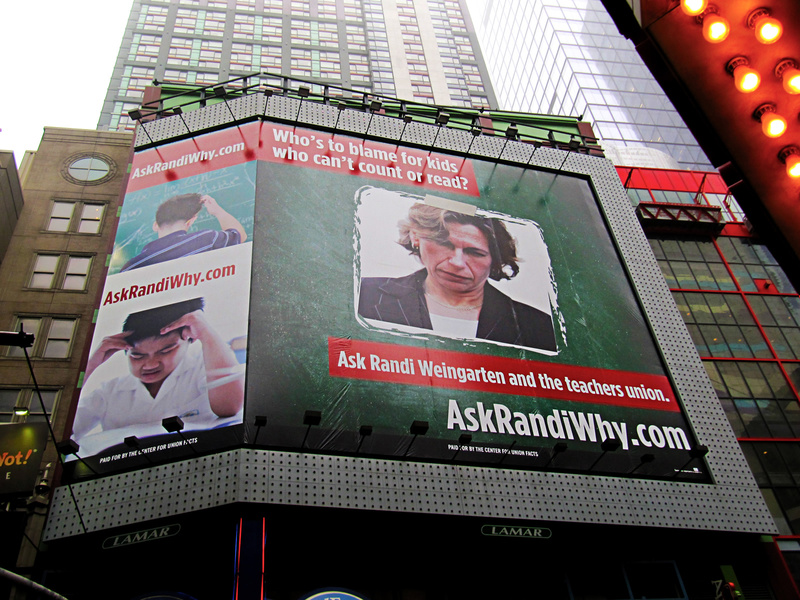 Since 2009 Randi Weingarten has been head of the American Federation of Teachers, where she has continued her crusade to stymie school reforms and protect the job of incompetent teachers. 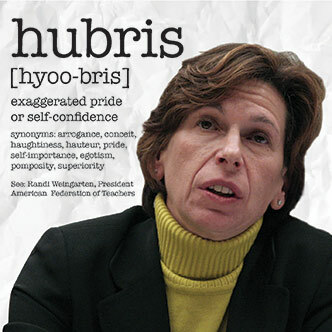 Since 2009 Randi Weingarten has been head of the American Federation of Teachers (AFT), where she has continued her crusade to stymie school reforms and protect the job of incompetent teachers. 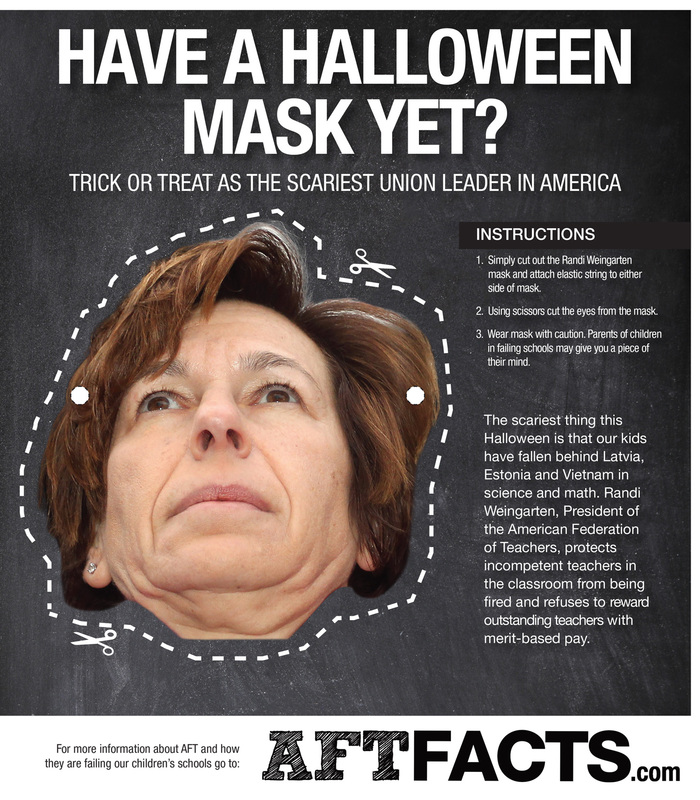 Weingarten previously ran the United Federation of Teachers (UFT), an affiliate of the AFT representing New York City teachers, serving also as the group’s treasurer and longtime contract negotiator. Weingarten styles herself as a reformer. Listening to her speak, you’d be forgiven for thinking that she was an education reform advocate. But Weingarten’s actions speak louder than her words. When the cameras are off, Weingarten and her union fights tooth and nail to oppose almost any attempt to implement promising education reform efforts. From performance-based pay, to increasing teacher accountability, to increasing funding for charter schools, Weingarten has fought on the federal, state, and local level to weaken or outright block many reform efforts. By outlining reforms in generalities without getting into too many details, Weingarten avoids backing herself into a corner on a specific reform. Although she’s spoken positively of many reform efforts, it seems that no specific reform meets her framework. Throughout the modern era, the AFT has used its political power to block and eviscerate serious education reforms… It has used its power in collective bargaining to impose self-interested work rules that make it impossible for the public schools to be organized effectively. Although AFT unions have sometimes gone along with changes about the edges, and in rare cases (New Haven, for instance) have gone somewhat further, this cannot be allowed to distract from the essence of their behavior. On the whole, AFT unions have been enormous obstacles to the nation’s pursuit of effective schools. That is what lies at the core. That’s a common refrain for Weingarten, who wants to ensure that her union and its teachers get something in return for acquiescing to reforms. 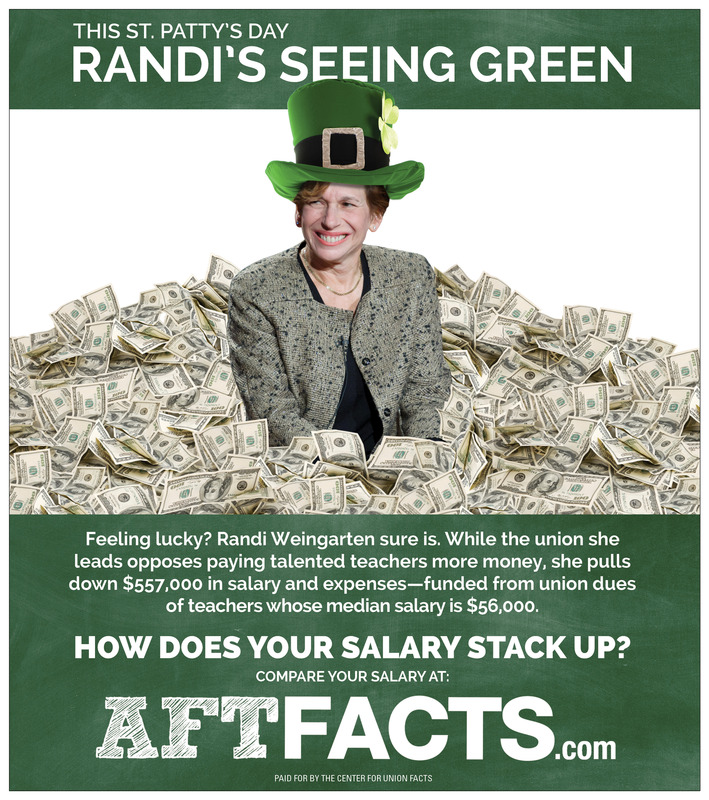 In 2008, Randi Weingarten took the reins as President of the American Federation of Teachers national headquarters. At the same time, Michelle Rhee was leading the struggling District of Columbia Public Schools—which were spending more than any state to little educational effect—with a strong reform agenda. Rhee and Weingarten had sparred before. In the early 2000s, Rhee’s group, The New Teacher Project, worked with New York City’s negotiating team that was hashing out a dispute with the UFT over seniority and tenure reforms, the same battleground Weingarten and Rhee would fight over in Washington. AFT Local 6, which organizes D.C. Public Schools teachers, went on the offensive against Rhee’s reforms, which included expanding charter schools and offering performance bonuses to highly effective teachers. Under enormous pressure, Weingarten and the Washington AFT local largely caved to a mildly reformist contract, which provided some provision for performance bonuses and teacher effectiveness evaluations, as well as extracting a 20% across-the-board pay increase. Reason magazine’s reporting suggested that the Washington local might have been more open to accepting a reform proposal closer to Rhee’s initial offer until Weingarten became personally involved in negotiations. Despite suggesting that the contract was reasonable, Weingarten and the AFT political machine in D.C. did not forgive or forget Rhee’s and Mayor Adrian Fenty’s efforts. In 2010, the AFT reportedly funneled $1 million into independent expenditure groups to defeat Fenty in the District’s Democratic Party primary election, succeeding in unseating Fenty in favor of the more union-friendly Vincent Gray. Fenty was not the first Democratic politician to see his career in office ended by Weingarten’s involvement in a party race. That honor belongs to former New York City Councilwoman Eva Moskowitz, who lost a 2005 Manhattan Borough President primary to a UFT-backed candidate. Moskowitz’s heresy against the UFT was holding City Council hearings on the union’s then 316-page contract with the city in 2003. Weingarten was outraged that public officials would expose the union work rules under which public schools operate. 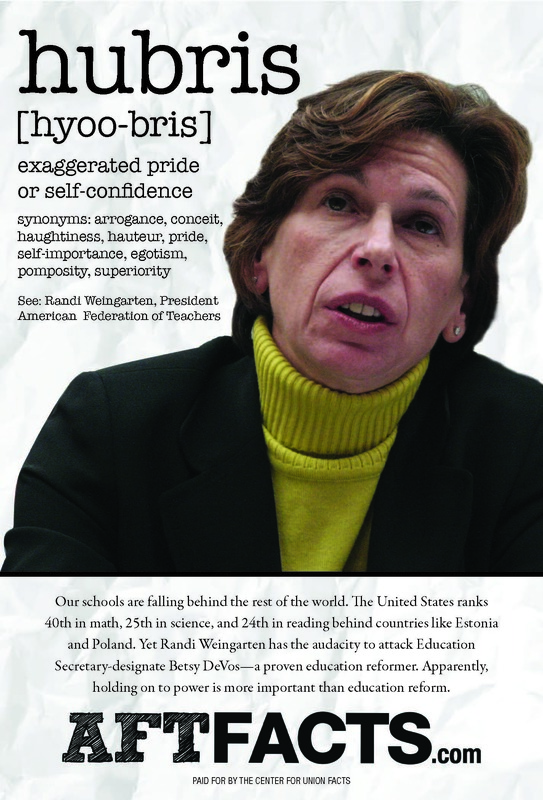 She accused Moskowitz of “demonizing teachers,” a phrase that has since become a staple of Weingarten’s anti-reform rhetoric. Her union openly compared the legitimate exercise of the City Council Education Committee’s oversight of education to the McCarthyite Red Scare of the 1950s. The hearings made widely known that firing a tenured teacher for incompetence was nearly impossible and that teachers with high seniority grades could transfer between city schools almost at will, regardless of schools’ need for them. “Tenure should be about fairness. It should not be a job for life, and if somebody cannot do their job they shouldn’t be there,” Weingarten has said. “If someone can’t teach, after they’ve been prepared and supported, they shouldn’t be in our profession.” But her record speaks differently. In New York City, that meant sending the most depraved teachers to so-called “rubber rooms,” where teachers who were not allowed to be in contact with students were sent to wait for their disciplinary hearings. And wait they did—oftentimes for years—with full pay and benefits. It wasn’t uncommon to find teachers in the rooms scattered around the city doing crossword puzzles or running online businesses. The New Yorker reports that the average stay in the city’s rubber rooms was three years. The New Yorker was able to speak to the now-fired teacher. She told a reporter: “My case had nothing to do with seniority… I never knew about this [UFT] Web-site article, and certainly never authorized it. The union has its own agenda.” The reporter stated the article was pulled from the UFT website shortly after that conversation. This attitude is nothing new. One seemingly clear-cut case for reform was the 1990 arrest, conviction, and imprisonment of Jay Dubner, a special education teacher who sold $7,000 worth of cocaine to an undercover police officer. Despite this, Dubner still collected his teacher’s pay and New York City was not able to fire him. But that all changed in 2010, or at least it was supposed to. When the issue came to head, and Weingarten’s union was forced to negotiate an end to the rooms with the city. 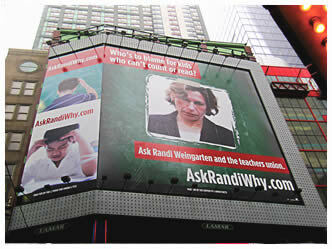 Weingarten admits that “there are some problems with the tenure system” in New York. But the contract she wrote with the city was supposed to “clean out the rubber rooms” by allowing the school system to hire 25 new arbitrators to expedite the process. Fast forward to 2013. Although the rooms themselves no longer exist, the number of sidelined teachers receiving full pay and benefits continues to number in the hundreds. The New York Daily News reported in October 2013 that there were 326 teachers and administrators still collecting pay while they wait for a hearing. In 2013, the delay in the tenure hearings cost the city $29 million, just $1 million less than when the agreement was brokered. So what happened? Although the contract allowed the city to hire more arbitrators, it also required that the union approve them. That’s right, more “process.” Although the agreement called for the hiring of 39 arbitrators, as of this fall there were just 19, and the cases are stacking up. In September, NYC sued the UFT for their failure to approve arbitrators. The lawsuit is pending. Records reviewed by the Voice indicate that she taught 122 days as a per diem teacher from September 1991 through June 1994, roughly one in four days. She then did what she told the Voice was her only full-time term in the fall semester of 1994, followed by 33 days as a per diem teacher in the spring of 1995. Despite spending so few hours teaching students, the generous union contract negotiated by her union ensured that Weingarten accumulated “a total of nine years of pensionable city time though she only did one semester of full-time teaching.” That’s a good deal if you can get it. 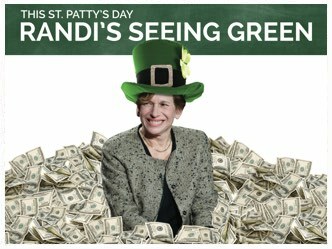 In 2010, Weingarten issued a statement regarding federal budget cuts proposed by the National Commission on Fiscal Responsibility and Reform, calling for “shared sacrifice”—that is, higher taxes on the wealthy. Yet Weingarten herself pulled in $428,000 in salary, benefits, and other disbursements from the American Federation of Teachers. An AFT spokesman told The Examiner “No, absolutely not” when asked if Weingarten would voluntarily take a pay cut. Ironically, Weingarten had moved in 2009 from New York City to East Hampton, a wealthy community on eastern Long Island—hardly a place of residence for the common man. The move ended up saving her $30,000 in personal taxes when she received a huge payout the following year upon leaving the UFT. Had Weingarten stayed in the Big Apple, her $600,000 compensation from the UFT would have placed her in the top tax bracket. When the AFT pretended to represent the “99%,” it conveniently forgot to mention that its boss, with her East Hampton residence, is a member of the elite.